When it comes to your landscaping you are probably inundated with similar gardening companies throughout London making you complicated promises and difficult pricing structures. Well at London Gardeners there are no hidden fees or charges and we can offer you a free quotation on request if you call 020 8434 7256 right now. We like to keep things simple so that our customers know exactly what they are getting, when we will be there and how much it will cost them. Our gardeners are proficient in all forms of gardening and landscaping so whatever you need we will be delighted to help. It really doesn’t matter to us how big or small your garden is, we are extremely passionate about producing creative and innovative spaces in the blink of an eye. 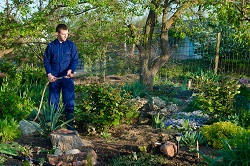 You can set up a regular appointment with one of our gardening experts to keep on top of your lawn care, hedge trimming and pruning, garden spraying and all forms of garden maintenance services. Once we have finished we will even deliver comprehensive garden waste removal so you really won’t have to move an inch to achieve a perfect garden. When it comes to lawn restoration and repair our specialist team can create luscious lawns that will attractive to guests, potential customers and anyone viewing your property. With our years of experience we can cover even the largest of spaces in the blink of an eye creating eye catching patterns and designs. At London Gardeners we pride ourselves on our outstanding customer service so we can guarantee you 100% satisfaction on each and every visit. Our gardening experts are also proficient in the latest landscaping trends and designs. It is extremely important to us and many of our customers that we create gardens that are ecologically friendly, supporting local wildlife by creating different habitats whilst keeping everything looking neat, attractive and removing weeds and promoting the growth of your favourite plants. Our reliable gardening team also has experience creating sensory gardens for disabled clients who still wants to enjoy the textures and scents in their garden, and the sounds of the water and birdlife. We are passionate about delivering the perfect gardens for our customers depending on your requirements whether that is entertaining space, room for a new dog kennel or space for children to play. Whatever you need, our garden landscaping experts will be able to create the perfect garden for you. So if you’re looking to find yourself a landscape gardener that won’t let you down then get in touch with us today by calling 020 8434 7256. Our one-off garden clean up is perfect to get everything ready for summer and is available at a fantastic price. You won’t find a better gardening team anywhere in London so look no further for a friendly, personalised and professional service. Our company has been building a superb reputation in the local area for a number of years, and we have built our reputation on producing perfect gardens each and every time. It doesn’t matter how big your garden is, all that matters is how you use the space that you have. 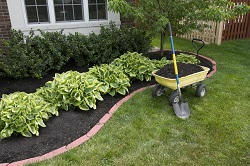 Landscaping is all encompassing from patio cleaning, to hanging baskets, to hedge trimming and pruning, lawn planting, lawn mowing, weed control, leaf collection and much more. Don’t struggle with it on your own, even if you need someone to mow the nature strip we will be delighted to help and offer the very best prices across all of our services. No job is too big or too small so get in touch with us today to find out more.